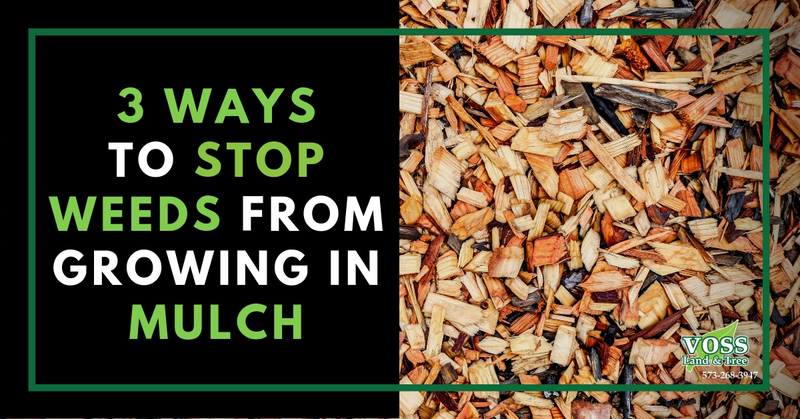 Mulch is great for your landscaping needs — it can help to preserve moisture, improve the fertility and health of your soil, and add some aesthetic appeal to your front or backyard. Another main reason mulch is purchased is to prevent the growth of pesky weeds from terrorizing your plants. However, why is it the case that sometimes even after mulching that weeds can still grow through? There are several reasons why weeds may be breaking through your mulch bedding. Follow our tips below to discover the reasons why and the best ways to prevent them from showing up again in the future! In Columbia, Missouri Voss Landscaping uses and suggests triple-shredded hardwood mulch to prevent weeds from growing. Higher quality mulch typically contains larger materials and chunks in it. If used liberally, about three inches deep, your high-quality mulch should prevent any future weeds from surfacing. Pro Tip: Use a dyed mulch to have your mulch bed retain its color all year long! Another sure-fire way to prevent weeds when planting your bed is to employ the use of a landscaping fabric. Landscaping fabric is a thin textile you can purchase at most local garden stores and is designed to prevent the growth of weeds by blocking sunlight to them. Once you have planted all trees, shrubs, or bushes in the area you will want to cut the fabric to size before you begin the mulching process. Since the material is relatively thick it should be easy for you to cut and shape it to fit perfectly in the location. Once in place, you’ll want to spread mulch as normal and cover the fabric completely. This will help to prevent weeds for up to 5 years depending on the type of landscaping fabric you purchased. Want to ensure your mulch bed is installed properly? Leave it up to the experts at Voss Landscaping & Tree to ensure your mulch is giving your trees and shrubs the most benefit. Our expert landscapers offer a wide array of landscaping services and will always apply the highest quality mulch! Having staff that is knowledgeable and passionate means that we understand the importance of doing the job the right way. Contact Us today with any of your landscaping needs!